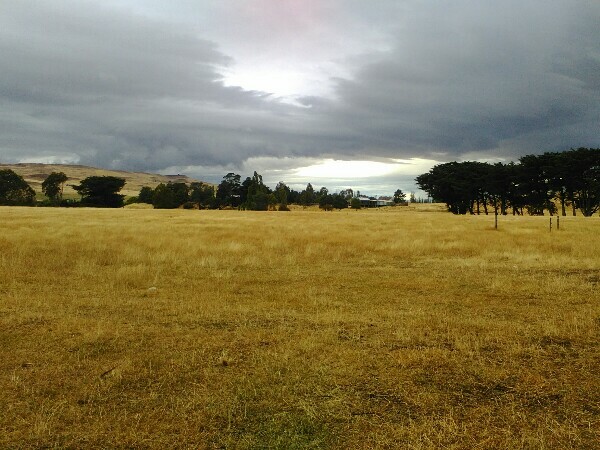 We woke from a peaceful sleep in the sheep paddock to the sound of rain on the tent. Unlike typical north Queensland rain, it barely settled the dust and was not serious enough for us to contemplate digging out our raincoats. It was handy to have a shelter shed available to keep dry while we ate breakfast, packed our gear and pre-cooked lunch. The rain had cleared before we were ready to leave at 10am, and we set off into another perfect weather day. 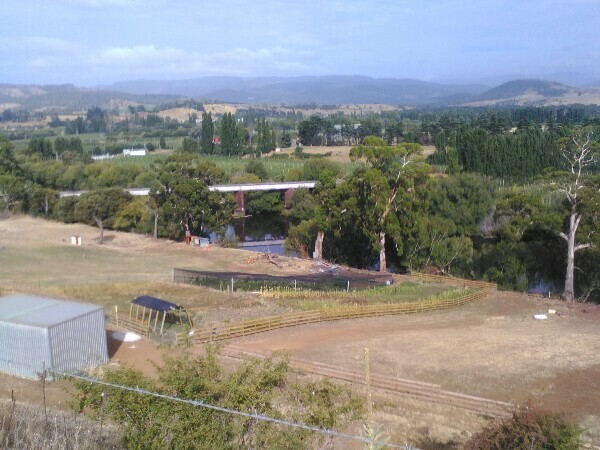 Stage 11 headed along a dirt road towards the Cluny Lagoon and across the dam wall at Lake Repulse. There were a few short, but leg testing climbs, rewarded by big views down the valley and back towards Ouse. 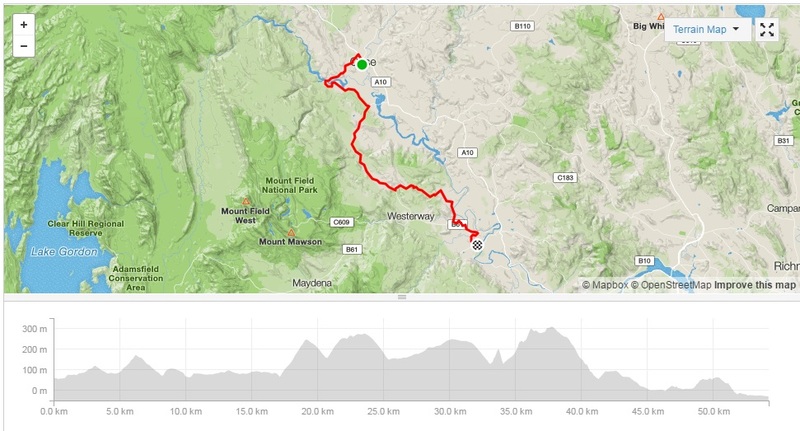 The route for cyclists splits from the horse trail for the majority of the stage, and we continued to enjoy an easy meander around the lake, thinking we were in for an easier day. 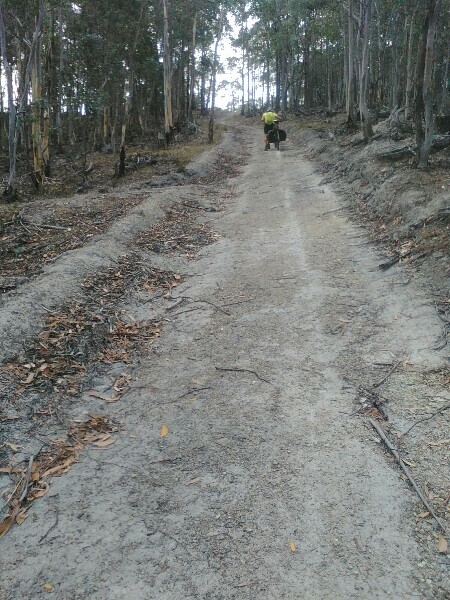 The route for horses was described as “very steep”, “very rocky” and a long climb, so we decided to accept the alternate route suggested for cyclists. At Kim’s urging, we stopped for our first smoko break as the dirt road rejoined the bitumen at the intersection with Ellendale Road. I had been planning a stop at the top of the little rise I could see just ahead of us. That little rise turned into an epic six kilometre long roller coaster ride, with three huge climbs each followed by a sharp descent into the next uphill stretch. I no longer felt any sense of guilt in bypassing the end of Stage 11 at Jones Camp, and was extremely relieved to finally arrive in Ellendale for lunch. The council workers at the picnic shelter had seen us on the road and were impressed to see us finally arrive. They assured us that it was all downhill to Bushy Park, apart from maybe one or two little sections. I think they hadn’t read the trail guidebook. We started downhill on a perfectly formed bitumen road out of Ellendale, keeping a lookout for the left turn through a gate into an old refuse site. We stood looking incredulously at this change of fortune, wondering once again what possessed the trail makers to divert us into this conservation reserve. My thoughts darkened further as we rode for a few hundred metres along a rough trail over numerous fallen branches and through thick undergrowth. I was reaching the mutinous stage when we came to the first of several un-rideable hills and scrambled up lugging an apparently unwilling Pokey along with me. 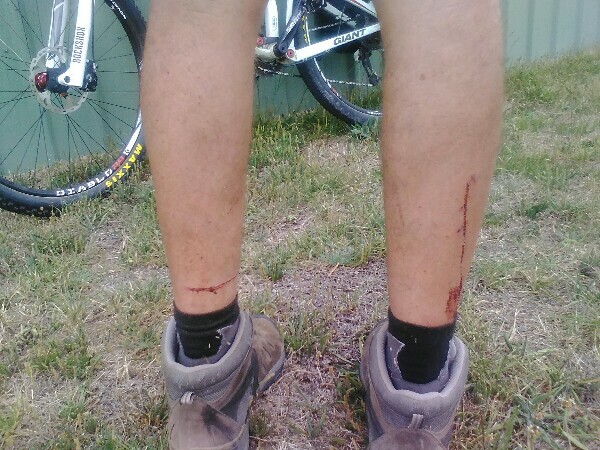 Kim wondered how we could tactfully make suggestions about including switchbacks on the trail, while also lacing the air with unseemly language as he gashed the backs of both legs on his pedal cleats during his scramble up the near vertical slope. We tried to entertain ourselves by making a time-lapse photo series of the climb and stopping for smoko, but I continued to question the wisdom of conserving this area for Trail riders. The wombats were welcome to it. 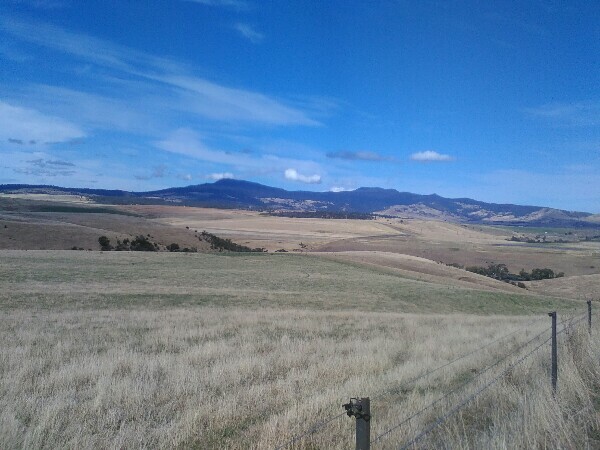 We neared the top of the main climb, and the bush opened onto a vast cleared paddock with views for kilometres all around. With a total change of attitude, we were then treated to the most amazing stretch of riding across a huge open paddock at the roof of the world. 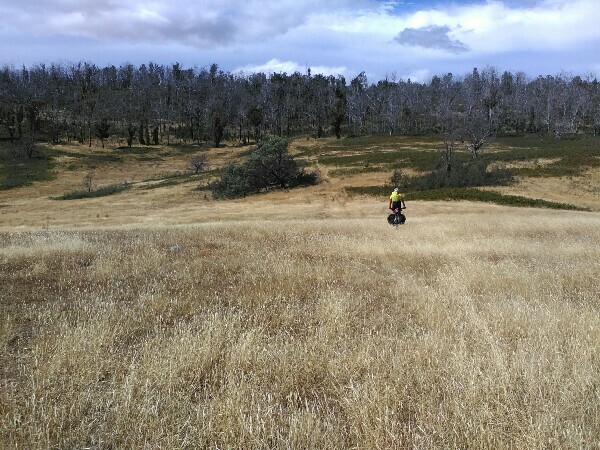 We took our time riding through the tall dry grass, following very feint vehicle tacks and passing through several gates. It was reassuring to see the occasional trail marker, as there were no other obvious landmarks apart from grass, fences and sheep between us and the valleys far below. Then trail passed by some old cattle yards and quickly dropped from the high country down a rough track into the valley. It was a stretch of more technical riding to add to our already very memorable day’s ride. 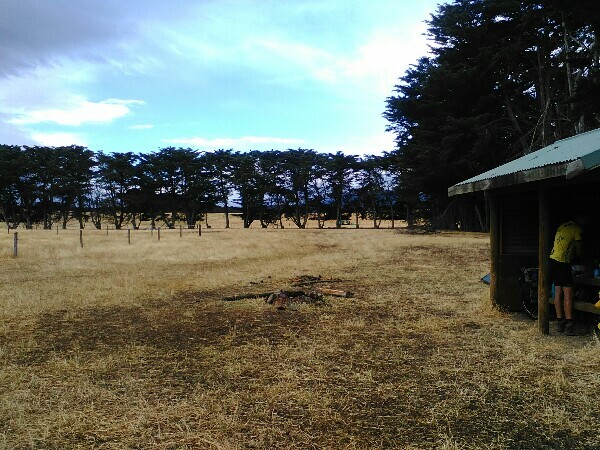 We followed a dirt road that turned into Fenton Forest, which is a farming property with numerous houses and a variety of crops. It had been a long day, and I was keen to finish. Kim and I debated directions at an intersection on the property, with Kim trying to convince me that the trail was again heading uphill, while I favoured the downhill turn, despite it not matching the directions or the map. Commonsense prevailed, and after one last climb we reached the start of a downhill track along the edge of the valley leading into Bushy Park. We reached our finish point at the showgrounds and waited for the cheerful caretaker to meet us with the key. It had been a tough day, but we have no doubt that our ride across the high country will stand out in our memory of our bike-packing adventures for years to come.